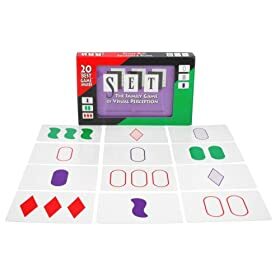 The SET card game will stimulate your kids’ mind and yours too. Get a great deal here. The SET card game is one of my favorite games. Get the SET card game here for a great price! SET has recently been awarded the Creative Child’s Preferred Choice Award. Families use this game to get the whole family involved, for instance a 6 year old might play with Dad or Mom. Teachers who work with Gifted Students say their children find this fun and interesting. The game SET claims to make people use both sides of their brain. This gets everyone’s creative and thinking skills going all at once.The general idea of the game is to collect as many SETS of cards as you can. To obtain a SET you will have to have three cards that either all match or all differ from each other. Each card has four different variations of the following four features: color, symbol, number, and shading. Twelve cards are put face up in the middle of the playing area. When one player sees a SET, they yell out “SET”. If everyone agrees it is a SET, the player keeps their SET. The dealer then replaces the cards that have been taken with new cards from the deck. Each SET is worth one point. The person with the most points win.